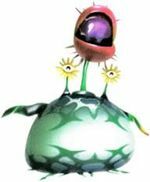 The chrysanthemum family contains two species, one classed as an enemy, and one as a plant, much in the same way as the Pikmin. 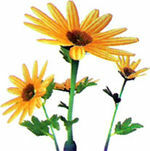 This family is based on the real-life chrysanthemum family. The Creeping Chrysanthemum is a carnivorous member of the Chrysanthemum family. It is a large plant-like creature with a red mouth, two eyes on its shoulders disguised as flowers, and two arm-like tentacles that it uses to move around. This creature disguises itself as a Margaret, rising up out of the ground and attacking prey that ventures near; as such, they are often found near real Margarets. It can be distinguished from a Margaret because its eyes are visible when camouflaged. Margarets are yellow, dandelion-like plants. They tend to grow in bright places, such as the Awakening Wood. Creeping Chrysanthemums are often found where there are many of these plants. This page was last edited on January 24, 2016, at 11:27.